PACMEN members at one of their meetings. Despite the large Hispanic/Latino population in Texas, enrollment and retention in higher education is low, and the Latino male college population is declining. Men are usually seen as the breadwinners. People with a Hispanic/Latino heritage or culture know that men are seen as the ‘jefes’ (bosses) of the house. They provide monetary support for their families, so school gets placed to the side. “We are the men, like we have to be the leaders,” said Ceejay Jimenez, a sophomore Nursing major. Generations are raised with these views and expectations. Miguel Medina, a Pre-Med major agreed. He said it was a tradition he’s been raised with since his childhood. 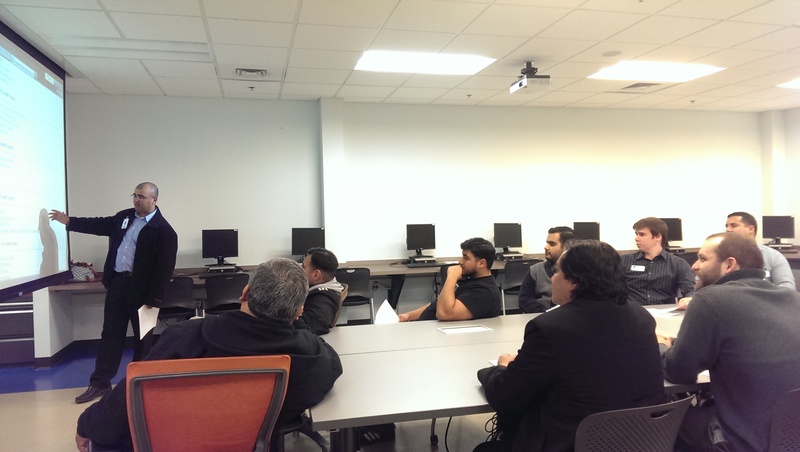 Eloisa Cordova, education support specialist, said that enrollment of Latino men has decreased at Palo Alto College. The campus keeps data on how many people are enrolled, how many are part-time or full-time, the number of completed degrees, age groups, ethnicities and gender. In the Fall 2013, 60 percent of students were females and 40 percent were males. The graduation rate for 2013-2014 was 67 percent for females and 33 percent for males. Cordova also mentioned that more part-time students are enrolled than full-time. This is not only a trend at PAC, but at other colleges, as well. Men are perceived as the principle source of income for their families. Either their parents need financial help, or they have a family of their own; some find it easier to work and start buying what they want; others believe that school is not for them, or they do not have the monetary support. PACMEN is a “network of individuals interested in the support, encouragement and direction of males in education on life experiences.” PACMEN has been on campus for two years now. Most recently, they hosted the HBO Latino premiere “Habla Men” on October 20. PACMEN hosts events and offers resources to encourage the individual growth of men, not just as students but as complete members of society. Ultimately, they aim to support and encourage men to pursue a healthy and proactive life. Students are motivated by their families, like their mother or brothers, their friends, or they encourage themselves. “I work and go to school,” said Paul Aleman, a Business Administration major who works full time and attends four classes. Aleman said that his employer is flexible with his work hours, and Aleman is able to attend classes on Tuesdays and Thursdays. This helps him balance his time. For more information on PACMEN, email Ximenez, or give him a call at (210) 486-3181.